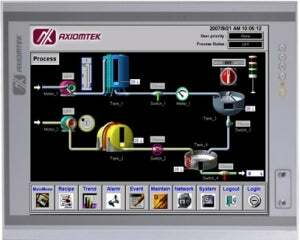 Axiomtek, one of the world’s leading designers and manufacturers of innovative, high-performance and reliable PC-based industrial computer products, announces the arrival of the P1197E-861, a ruggedized 19in expandable industrial touch panel computer. The P1197E-861 supports 2nd and 3rd Generation Intel® Core™ i7/ i5/ i3/ Celeron®/ Pentium® processors in LGA1155 socket with Intel® H61 Express chipset. The P1197E-861 is equipped with a 19in SXGA TFT LCD display with high-brightness LED backlight (350nits) and and has an IP65/NEMA 4 compliant front panel. Built around user-convenience, this stylish touch panel PC adopts a less screw and slim mechanism design. The slim-type industrial grade panel unit supports complete expandability features, including dual display interface, one expansion slot, eight USB 2.0 ports, four COM ports and Wi-Fi connectivity, making it suitable for kiosk, factory and automation. "The less screw design makes P1197E-861 easy to install. The compact form factor and IP65 compliant housing make it reliable to operate in any extreme environment. Its slim yet expandable design also fulfills different requirements," said Debbie Tu, product manager of product marketing division at Axiomtek. "In addition, this outstanding all-in-one unit supports four COM ports, eight USB 2.0 ports, flexible expansion interface (one PCIe x4 slot or one PCI slot), built-in speakers and optional Wi-Fi 802.11 b/g/n module and supports two 2.5in SATA HDD trays for easy maintenance. The P1197E-861 is an excellent solution for factory automation, kiosk and more industrial fields." The P1197E-861 has one PCIe x4 or one PCI slot for expansion purpose. User can easily plug in a standard half-size PCIe or PCI card based on any application needs. The 19in industrial touch panel PC features built-in speakers for kiosk application to display multimedia content program. It also supports WLAN module antenna (optional) for wireless network connectivity. The all-in-one P1197E-861 supports two 2.5in SATA HDDs with convenient side access trays. Without the complicated steps, users can maintain hard drive easily that make the work more efficiency. There are only three screws on the back chassis, which users can quickly remove it and install with ease. It saves time, maintenance cost and increases work efficiency. To withstand harsh operating environments, the expandable panel system is made with robust aluminum housing and has an IP65/NEMA 4 water/dust-proof protection to prevent the system from outside damage. Axiomtek P1197E-861 includes two DDR3-800 SO-DIMM sockets with up to 16GB memory. Interfaces for DVI-D, VGA, four COM (3 x RS-232, 1 x RS-232/422/485), eight USB 2.0 (two front USB & six back USB), 2Gb Ethernet ports, audio (Line-out), and two 2.5in SATA HDD drive bays are available. For more product information or pricing, please contact Axiomtek.